Lauren Hill, NCAA Basketball Player Who Battled Cancer, Dies The 19-year-old freshman at Mount St. Joseph University died Friday from brain cancer. Her nonprofit foundation has helped to raise more than $1.5 million for cancer research. 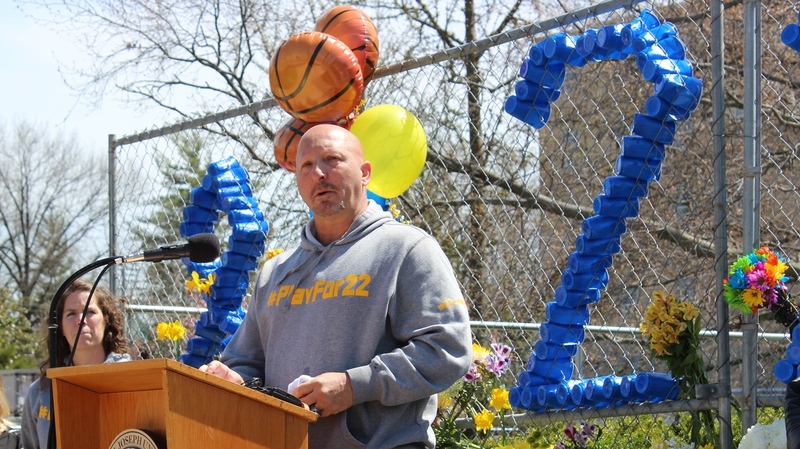 Mount St. Joseph University women's basketball coach Dan Benjamin spoke at a vigil for Lauren Hill Friday. The 19-year-old freshman died after a battle with brain cancer. Lauren Hill, a 19-year-old freshman basketball player at Mount St. Joseph University who inspired many to live life to the fullest, died Friday from brain cancer. Her nonprofit foundation helped to raise more than $1.5 million for cancer research. One of Hill's final wishes was to play in a real college basketball game, so the NCAA agreed to move her school's first game up by two weeks. During that game in November, Hill made the first basket of the NCAA season. It was a two-point shot that stopped the game as a sold-out arena of 10,000 erupted. The crowd was there to see Hill and to support her. Even the opposing team cheered. Just before she started college, Hill was diagnosed with an inoperable brain tumor. Doctors told her she had less than two years to live, so she kept living. She went to school, began raising money for cancer research and played basketball. She played through her tumor, which made the loud noises and bright lights of the court hard to bear. In December she stopped playing as her condition got worse. Hundreds gathered Friday at Mount St. Joseph University in Cincinnati for a vigil. "The toughest thing for a coach ever, ever, to do, is to deal with a loss," said Mount St. Joseph women's basketball coach Dan Benjamin. "We lost a player. We lost a friend, a daughter, and we lost an unselfish angel." Click on the audio link above to hear the full story. Mount St. Joseph University freshman, Lauren Hill, made the first basket of the NCAA season last November, a two-point shot that stopped the game as a sold-out arena of 10,000 erupted. The crowd was there to see Lauren Hill, to support her. Even the opposing team cheered. Just before she started college, Hill was diagnosed with an inoperable brain tumor. CORNISH: Doctors told her she had less than two years to live, so she kept living. She went to school, began raising money for cancer research and played basketball. BLOCK: She played even though her tumor made it hard for her to bear loud noises and bright lights. In December, she stopped playing as her condition got worse. Lauren Hill died early this morning. Hundreds gathered today at Mount St. Joseph University for a vigil. UNIDENTIFIED GROUP: (Singing) Amazing grace, how sweet the sound. CORNISH: Coach Dan Benjamin spoke at that gathering. DAN BENJAMIN: The toughest thing for a coach ever, ever to do is to deal with a loss. We lost a player. We lost a friend, a daughter. And we lost an unselfish angel. CORNISH: Benjamin added that Hill's lasting legacy will be the awareness she brought to cancer research. BLOCK: Lauren Hill helped raise more than one-and-a-half million dollars for that cause. That game in November raised $40,000 alone. CORNISH: And it fulfilled one of Lauren Hill's final wishes, to play in a real college basketball game. The NCAA agreed to move her school's first game up by two weeks, allowing her to play in that November match. LAUREN HILL: Today has been the best day I've ever had. BLOCK: That's Mount St. Joseph University basketball player, Lauren Hill, number 22. She died today at the age of 19.